One night after delivering a historic acceptance speech at the Democratic National Convention, Hillary Clinton emphasized her economic agenda during an engaging rally at Temple University. Clinton was joined Friday by her vice presidential candidate, Tim Kaine, as they kick-started a joint bus tour across Pennsylvania and Ohio that will focus on jobs. "As of tomorrow, we have 100 days to make our case to America," Clinton said. "What better place to kick off this campaign than right here in Philadelphia, where it all started 240 years ago. I believe with all my heart that our founders came together to create one nation because they understood what we understand — we are stronger together." Thousands of supporters crowded into McGonigle Hall, waving flags and chanting "Hillary" throughout her remarks. At one point a handful of supporters called out, "We love you." Breaking from her speech, Clinton turned and acknowledged her appreciation. Clinton took a casual approach throughout the rally, playing to the intimate vibe of McGonigle Hall, an old basketball gymnasium formerly used by Temple's basketball teams. "I don't know about you, but I stayed up really late last night," Clinton told the crowd. "It was just hard to go to sleep. It was so exciting, but I have to tell you it was also kind of overwhelming." The rally originally was to take place on Independence Mall, but the threat of rain forced campaign organizers to move the event indoors. Instead of Independence Hall serving as a symbolic backdrop to a large-scale rally, Clinton and Kaine spoke in a more personal setting. Former President Bill Clinton and Kaine's wife, Anne Holton, joined their spouses on stage. "We were right down on the floor," said Judy Williams, 56, of Wayne, Montgomery County. "To really feel them as the authentic people they are is cool." Kaine recounted the ways his Jesuit upbringing prepared him for a career as a civil rights attorney, acknowledging his surprise when portions of the crowd cheer enthusiastically when he specified his Catholic faith. He then outlined the intent of the bus tour, which culminates Sunday in Columbus. "Secretary Clinton is going to be laying out why she's going to be such a fantastic president," Kaine said drawing a contrast between Clinton and Republican Donald Trump. "Don't you want a president who knows how to battle and get things done for regular people? Of course, you do." The crowd responded with cheers throughout the rally. Afterward, people pushed up against the barriers to snap photos and pose for selfies with Clinton and Kaine. Dan Maloney, 21, of Doylestown, Bucks County, said he was glad to participate in the first campaign event following Clinton's historic nomination. "It was exciting to be a part of that and feel that energy," Maloney said. "I think everyone can appreciate how important this is culturally." 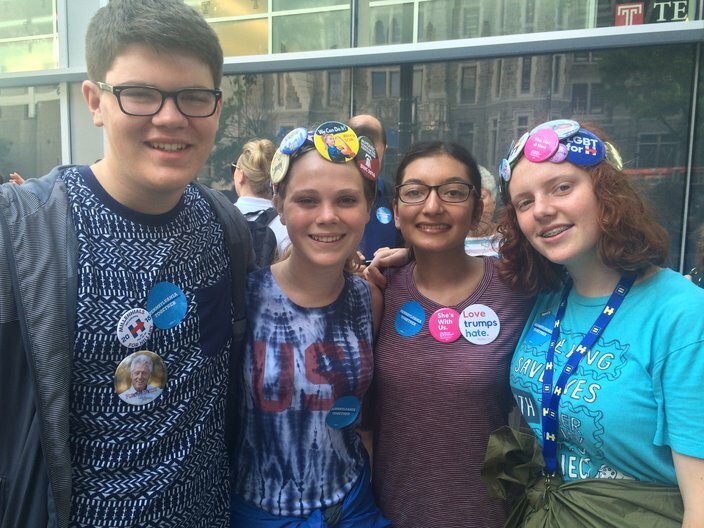 Nate White, 16, Lizzy White, 13, Saira Salyani, 15, and Bryony Mogan, 15, wait outside McGonigle Hall prior to a campaign rally featuring Hillary Clinton and Tim Kaine. The teenagers traveled from Malvern, Chester County to attend. A line of supporters formed on North Broad Street long before the doors opened at 9:30 a.m., stretching several blocks. Clinton's Thursday night address remained on their minds as they readied to rally behind the first woman to be nominated for president by a major political party. Kelly Kinnan, 53, of Harleysville, Montgomery County, spent the entire week watching as much of the Democratic National Convention as she could. She was impressed by Clinton's address. "Speeches are not her strong suit – she's much better in a personal setting," Kinnan said. "But her speech was fabulous." Clinton's historic nomination also had many others gleaming with pride as they waited to hear her speak. "When I was a little girl, I couldn't have a paper route – only boys could have paper routes," said Jane Allison, 58, of Oreland, Montgomery County. "It's moving to me to have a woman running for president." Saira Salyani, 15, of Malvern, Chester County, shared a similar excitement as she waited with her teenage friends to enter McGonigle Hall. She is set to serve as a campaign volunteer for the next three months, registering voters and making campaign calls. "I'm really excited for my kids and grandkids to look in their history books and see the 2016 election," Salyani said. "I'll be able to tell them about it because I worked on it."